My three girls read this for me and gave me some great help, corrections and pointers. They also had about the same reaction. Justine phrased it best, “Mom, this is supposed to be bizarre, right?” Well, actually yes, it is supposed to be bizarre, because I think we have lost a bit how absolutely bizarre the life and death of Jesus the Christ really was and is. So ….. for what it is worth, which is never much, here’s a bizarre poem. I walked the ridge above the city, lookin’ down, lookin’ down. Fog hid dirty sky, and below, the trees greened the grey. I saw You laughin’ like a crazy fool, balanced high, like a clown, like a clown. Holdin’ Yourself parallel to gravity, You teased me to believe You did it. Folk who dance for no reason are insane. Men who dance in trees are fools, Jesus, ain’t y’all figured that out? If only I could clearly hear the way You sing the silly songs, silly songs. Knowin’ You became the acrobat to make me laugh through my angry stupid sobs. You balanced all the earth between two cross beams. You forgave my mocking with your mocking Tourette’s dance on Calvary. You mock all my agonies and all my wrongs, all my wrongs. Makes me feel my spineless, dirt- crawling, worm-ness. Becoming birds and flyin’ away, flyin’ away. O Happy Day! O Happy Day! A Metaphoric Cirque de Soleil! You wink at me, and blow a raspberry at my fear, “Come on up, scaredy cat,” You yodel. And I try a clumsy, graceless pirouette, land- bound, while a middle aged couple I neglected to see sneak up, and gawk at the fool on the hill, but they be missing The Fool still dancing in the tree. You. With their pit bull to protect them when their policies don’t. In order to prove they believe in something, anything, that how desperate they be. Just click your heels together and poke some ink under your skin and all the world will marvel. I try a jette and the dog snarls, as does the woman underneath her breath. Your foolishness is rubbing off on me. World Weenies, go away, go away. Come and play another day, ‘nother day. I gotta get ringing round dat Rose o’ Sharon. I gave up american idols to waltz with You. Lordy, I pine for You, pine for You! You did the Pine for me so I will take up my pine, and pine away, pine away. I hope to dance, like an idiot, like a moron, like a Crazy-A Fooh, like an autistic, ADHD, Aspergers, special needs fool for Christ. Jesus busts a move up on dat tree, and I boogie into the mosh pit of His Holy Rolling Groove. Not livin’ like a paralyzed prisoner of my own regrets of not joining Le Grande Ballet. I be Fred Ginger Nureyev Jackson Pavlova. I gonna’ find in foolishness a joy that lights the world with madness. What a crazy world if all danced like You did. Like you do, high in the trees, in the stars, on the road, in the eyes, in the gazelles and newts, dancing in the clouds, the drippy drops, the rays, and platypus paddy feet, yo, if I don’t dance, the rocks gonna be rock and rollin’, rock and rollin’. You ain’t a- jokin’, ain’t a- jokin’. Now I’m laughin’ so hard, I’m peeing my pants. I’m waitin’ now at home, like a novice in The Green Room. I last saw You cacklin’, grinnin’ like a madman in the top- most bulge of pine, of pine. They be thinkin’ me a joke. Oh, the jokes on them when Saturday Night Fever runs its course and Your eternal disco ball lights up The Dance Floor. Oh My God, I knew that in that moment, You were mine, You were mine. Not a sad, serious Man of Sorrows always bleeding and alone, walkin’, crawlin’ slow. Makin’ me laugh, You chasse away this world. I’m only trying to follow Your moves. You Done and Gone Wacky, Jesus! Bustin’ yo’ moves on earth as it be in Heaven. You ball change and balance me by keepin’ me off balance. I take Your hand and you lead me in The Dance. and pray God, I can go wacky dancin’ wich you. I am usually out on dark and uncharacteristically quiet streets each morning. This makes me sound suspect or mysterious but frankly I find if I’m not out jogging before work, I’m not out jogging period. Sometimes I go to the YMCA and work out there but usually I prefer the non-peopled life of 5:00 am on the bad back streets of Monrovia. It’s a freeing feeling to be out alone and flying along in my Nikes. 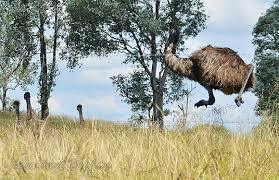 Though I must admit, once it was the young running flight of perhaps a swallow, now my running is a bit more like an Emu flying. The streets of course are never completely unpeopled or un-animaled. Cars never sleep in L.A. and cars need people to drive them unless you are that guy in San Diego who has the car that drives itself. I changed my running route a couple years ago after meeting up three times with three separate mamma bears. Real bears. I am a metaphoric mama bear myself sometimes and I know, you do not mess with mama bears. You change your route. You do not eat their porridge. Goldilocks was an idiot and probably was in reality eaten as an appetizer, and when well-meaning people say to me, “Don’t be afraid, the bears are more afraid of you than you are of them”, then I really know that Americans are getting dumber every day. I personally refuse to believe that an animal that is seven feet tall when standing and weighs 1000 pounds is afraid of me. And by the way, if you even look like you are going to hurt one of my bear cubs, I will show you what a mama bear can do. On my morning jogs, I see cats, coyotes, skunks, road kill, dogs fenced in, squirrels, rabbits, and birds. 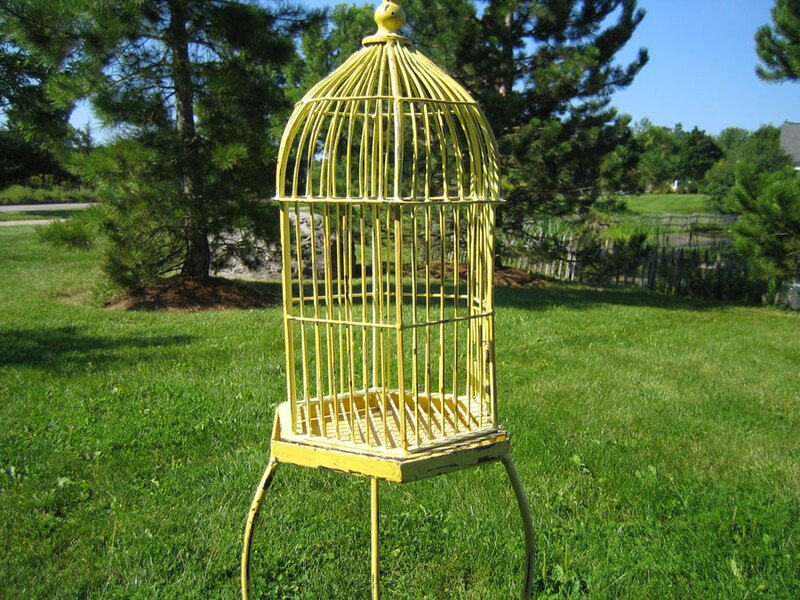 On one of the routes I take there is a house with a fenced in front yard and in the front Western corner of the yard is a large, rounded, sort of old fashioned bird cage. In the cage are all sorts of toys and climbing things so you can see the cage is not merely decorative but is used to keep a bird in it. I imagine the owners of the cage, put the bird outside during the day so it can get some fresh air. Can you even start to imagine how ironically sad this is? See, the people are correct in thinking that the bird will be happier if it is outside. They mean well. But this is like saying that I am happier if I am not in a wheelchair for the rest of my life. Can I be happy if I am in a wheelchair? But of course! Would I be happier if I were free to walk around, jump, run, not take the handicapped spot? Would the bird be happier if it were free to fly? I have struggled with keeping any sort of pet caged or fenced in, but a bird? The definition of bird is: it can fly. I think the Bible often tries to gently let us know that since The Fall, we see through a barred cage. We are that caged bird and sadly and ironically we often put ourselves in the cages we woke up to this morning. And even more tragically, if we know that there is kingdom life just outside the caged world of sin, death, and sorrow, a different life in which we could “soar as on wings of eagles”, but we willfully choose to live handicapped with wings clipped, well, how ironically sad is that? We were created to fly but we prefer to play with our toys and hope that someday, we will live a different life in heaven. But just like a bird that has been caged its whole life, if we don’t practice flying now, what makes us thing we will know what do the other side of eternity? Jesus often asked people first, “Do you want to be healed?” Some days, I admit, I don’t. I foolishly think I am safer and happier in my little locked cage. Maya Angelou poetically wrote these words in her autobiography: “I Know Why the Caged Bird Sings”. And those of us who know the freedom, joy, straight path -ness, and flight of kingdom life in Christ, know why we sing as well. “I sing because I’m happy. I sing because I’m free. His eye is on the sparrow. And I know He’s watching me.” If you have ever truly opened the cage door and let yourself free fall into Christ’s salvation life, Jesus’ Gospel, the Kingdom of the heavens where all fly free, then you know that caged reality is not how we are wired and created to live. We are created to fly. What does it mean, to strain your eyes until you can see the world as Christ wants us to see it? We would see the world without bars. We would no longer be enslaved to whatever is enslaving us. We would be unafraid to take flight. Am I so afraid of the metaphoric bears around every corner, that I lock down my heart in a safe box? Or do I believe that God loves the little birds so much that He will always provide just enough for the day for me? Am I so greedy for a crumb of food that I hunt and peck in the little food box the Master of this World stores for me, choosing the seeds of destruction by ennui or greed? Or could I believe that God has called me to a world full of delights created just for me but understanding that I only have that freedom when I realize I was created to live solely for Him? Do I get excited about going outside for party time and “Polly wanna cracker” time, and settle for a world in a cage of “eat drink and be merry” epicureanism? Or do I believe that God created me to fly on the wings of utter “shalom”, living a wholeness of being that Jesus lived fully, joyfully, relationally, and eternally? Practice flights for eternity, anyone? Jesus does not promise us that if we live kingdom life we will live free of sorrow, suffering, pain, need, want, temptation, or dying. Christ wasn’t free of any of those things. So what does it mean to be free in kingdom life? It means that I know why I sing. The Psalms, those records of human life with Yahweh, abound in singing exhortations and examples. Psalm 96: Sing to the Lord a new song. Ps. 104: I will sing to the Lord all my life. Psalm 100: Make a joyful noise to the Lord. Ps. 13, 95, 33, 71, 8, 30, 40, 47 and on and on. These Psalms and so many others come out of the hearts of a people who were mostly imprisoned or captive. The Israelites were so often caged birds. Read the great stories and time and time again, the response of God’s people is to sing. Moses sings, David sings, Isaiah sings, Paul sings. By the waters of Babylon, the people sing. We don’t sing because we are always happy, we sing because the “joy of the Lord is our strength”. And when we sing despite whatever life lets rattle our cage, then we are free and beyond happiness, we find true joy. We find our center and why we were created. What we are promised is that we will know with complete peace of mind and heart that we were not created to live alone in the caged world of immediate gratification and safety. My Sunday School teacher Jim Wilder gave a wonderful lesson and apropos to this idea when he said, “You are never so safe as when you are living in the purposes of God for your life.” We may not fully know or understand what those purposes are. But we can know that God’s purposes are not to stay caged in places where we think we are “safe”, either bodily or financially. I can trust, I think, that God’s purpose for my life is not to live in a cage. Do you ever notice that you never see a bird alone? Birds of a feather flock together, don’t they, and we were created to flock together, hunting and pecking and flying. This world is not our home, but we can see what home should look like. We can tear down the bars of our pride and our fear and we can love. We can tear down the bars of our greed and need and we can do a better job at sharing. We can practice flying even if we won’t really fly until resurrection day. We can understand that the World puts up bars of injustice and greed and lust and hate and that we are called as a people to tear those bars down. We can tear down those false idols that imprison us whenever we can. We can be afraid of the bears of evil and Satan, they really can hurt us, but we can follow God’s route and walk a different Way, so we don’t run into the bears. We can refuse to cage others even if we have the power to do so. And we can sing, sing, sing in a “dry and weary land where there is no water”. Because our thirsty hoarse singing voices are quenched with the Living Water of the Choirmaster Jesus, the Christ. Eric Sarwar grew up singing psalm portions at home and church. When strangers attacked him in 2009, and his parents and wife in 2010, he took comfort in Psalm 18 “the most popular psalm in Pakistan. It represents God’s providence, safety, power, deliverance, and kindness. In our context of living below poverty line and facing discrimination and hard challenges every day, it gives hope and encouragement. Its musical tune and rhythm is simple, catchy, and on high notes with shouts of joy,” he says. Eric Sarwar and his Pakistani fellow Christians, choose to fly outside the cage of oppression, fear and poverty. They know why they sing. 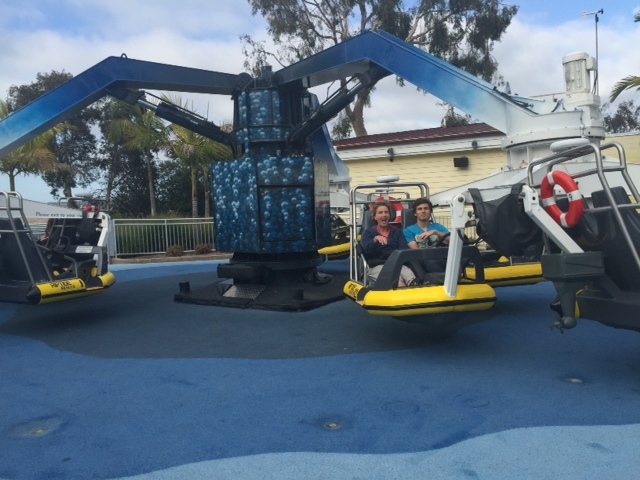 Here is a picture of Jane flying despite her fears and next to her is her fearless son, Gordon. See her singing? Okay, I’m screaming but when your son asks you to ride with him, your heart sings even if your mouth is screaming. Jesus is asking us to fly with Him. And he is fearless and can hold a tune in a storm better than any one. Time to open the door, give the wings an old practice run, and sing. Fa, la, la, la, la.